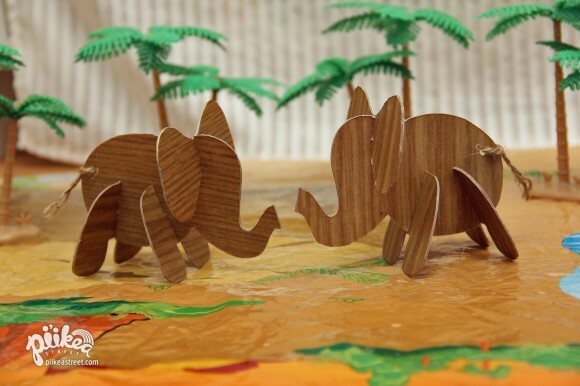 Faux Bois Elephants | Pi'ikea St. Wooden toys are nice to have but they’re pretty bulky to take with you anywhere. 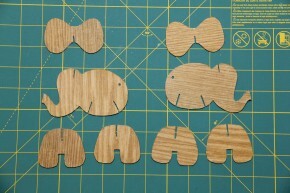 Our faux bois elephants are collapsible and travel nicely in a sandwich bag or even a wallet. For this craft you’ll need to peruse the scrapbook paper aisle at your local craft store for a sheet or two of wood grain paper. You can easily find them online too. Open up your cereal box and cut out one of the larger panels out. 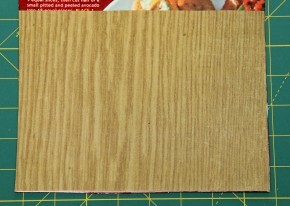 Cut two identical sizes of scrapbook paper and glue one on each side of the cardboard panel. Be sure to cover the entire paper with glue. Allow to dry. Draw pieces for the ears, body, and legs. Then cut them out. Punch a hole for its tail. Use this photo as a guide to see where to make the connection cuts for the body parts. When you make the cuts, be sure to make them as thick as the cardboard. If you make them too wide, the legs fall off during playtime. Finally, tie a piece of string through the hole for your elephant’s tail. Whip these out the next time your little ones get antsy at the grocery store or when you’re dining out. They’ll have fun putting them together as well. Enjoy!